After waking in terror last night during a particularly violent thunderstorm, it was fortunate that my nerves were to be soothed this morning by the unique combination the company of Ms Sourdough and muesli. There is nothing like a bowl of oats to fortify the spirit (and to activate the gastrocolic reflex, but as it is not polite to mention this in conversation this important truth is relegated to brackets). It had been a while since Ms Sourdough and I had managed to align our schedules to facilitate a coveted weekday breakfast and so I wanted to take her somewhere memorable. That place was Miss Marmalade, a cafe tucked away in Union Street, just East of Barry Street and opposite the Union Hotel in Brunswick. How could I resist the Inception-esque allure of a muesli within a Miss Muesli within another Miss? Miss Marmalade is a charming place. The faded-white awning overhanging planters brimming with…plants…(botany is not my forte)… outside is reminiscent of an old country town general store. The homeliness of the warm, rough brown of the counter and furnishings is accentuated by the dark brick walls and the warm light reflecting off the array of enticing cakes displayed in quaint glassware. There is an eclectic mix of decorative pieces including a collection of green bottles hanging on a wall – which brings to mind the consequences of what happens if one should accidentally fall – how endearing to be reminded of primary school bus songs in such an unexpected setting! How pleasantly fresh. The thick, creamy vanilla yoghurt was divine and was the perfect vehicle for delivering the soft, earthy oats and crunchy nuts into my person. The berry nuttiness of this dish was not a misnomer, the joy of encountering whole hazelnuts and macadamias with every bite is only comparable to the joy of not being allergic to nuts. There were so many nuts! What a treat. The slight spice that I now know is attributable to the dukkah was a lovely accompaniment to the tartness of the raspberries and blueberries, as well as adding to as the crisp freshness of the sliced apple. It speaks volumes for this muesli that not only did I love it, but so did Ms Sourdough and she has a much more refined palate than the one in my relatively-uncouth yap. Final word: Take this opportunity to be adventurous and explore the backstreets of Brunswick to find Miss Marmalade. 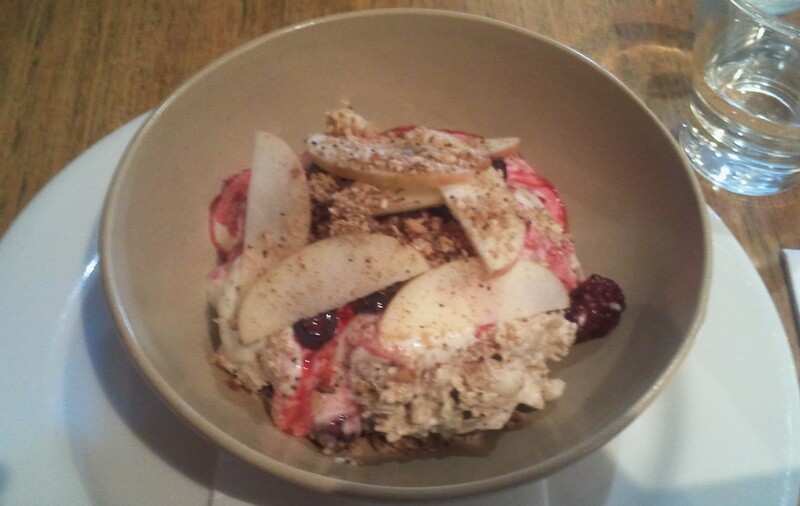 Your reward will be great, as this muesli is one of the best in town.